Himesh apes himself getting a new high in nasal singing, using phrase of his own song, mad mad Lonely is weirdly addictive. Balma works, just because of Shreya in otherwise tacky arrangements with so called tribute to RDB. Mika's next Long Drive is that typical punjabi hip-hop thing nothing to brag about. Starting quite similarly as his songs of Radio, Saari Saari Raat is an interesting tune. If you don't mind Himesh singing (I don't, here) this one is surprisingly good. If Lonely was mad, next one has insane lyrics - Hookah Bar sets new standard in silly wordings with annoying techno beats. Title track Khiladi Bhaiyya is filled with those standard HR loops all over, suited for the OTT colored movie. Tu Hoor Pari has minimal arrangements for a perfect punjabi folk flavored track. Quite an engaging one. Looking at the trailer of the film, you can't really blame HR for an average album. But still, the guy seems lazy at qualitative arrangements and hence churning out his typecasted work, with occasional sparks. Khiladi 786 is a mixed bag that obviously serves its intended purpose for the OTT entertainer. Jiya Lage Na goes straight to your heart instantly. The 'deja vu' feel is there, of course, being a semi classical tune. Fusion is excellent and equally great vocals by Sona and Ravindra Upadhyay. Lyrics by Javed saab, are apt for the dark, mysterious tale. This, is the best one from Ram Sampath's soundtrack of Talaash. Continuing that mysterious feel, Muskaanein Joothi Hai - is that standard jazzy-dark-night club-what will happen next - song. Suman Sridhar's voice perfects the arrangements that remind of such songs we used to hear in classics. Choosing Vishal for Jee Le Zara seems a perfect decision for this uplifting tune. Pretty engaging one. While next one Hona Hai Kya sung by Ram Sampath is strictly a situational one with shades of Don. (and there, I missed SEL, for Excel movies) But Ram steals limelight with his old school'ish tune of Laakh Duniya Kahe. A lovely soft rock number with wonderful chorus singing. How I seriously missed Sona's voice in this one. My Picks : Jiya Lage Na, Laakh Duniya Kahe. Tags : Talaash story, talaash songs, talaash music review, talaash songs, suman sridhar, Ram sampath, wife, sona mohapatra. Having read all the tweets on Twitter, about how unreal the movie is. Well, I want to say is - fantasies have always been a part of our movies. It always will be. Whats wrong with such movies if done properly? Fantasy shall not always set in past or in future. One can always write such story in parallel times. And Karan Johar exactly does that in Student Of The Year. Yes, the 'school' is 'more than perfect'. Every thing is exaggeratedly clean and shining. But hey, this is a movie, right? Not a documentary. Eat the candyfloss if you don't have diabetes. That's it. I had zero expectations, so enjoyed it. Go, do the same. To keep it short, here, I have listed out - what I liked, and what not. 1. The over-the-top-larger-than-life things the movie. Quite a change from oh-this-is-so-real-life movies throughout this year. (before you start bashing me, i loved all those movies btw). 2. Fantastic intro of all the three newcomers. No one can do it better than this. 3. Leading men. Yes, surprisingly I liked Sidharth Malhotra's performance too. 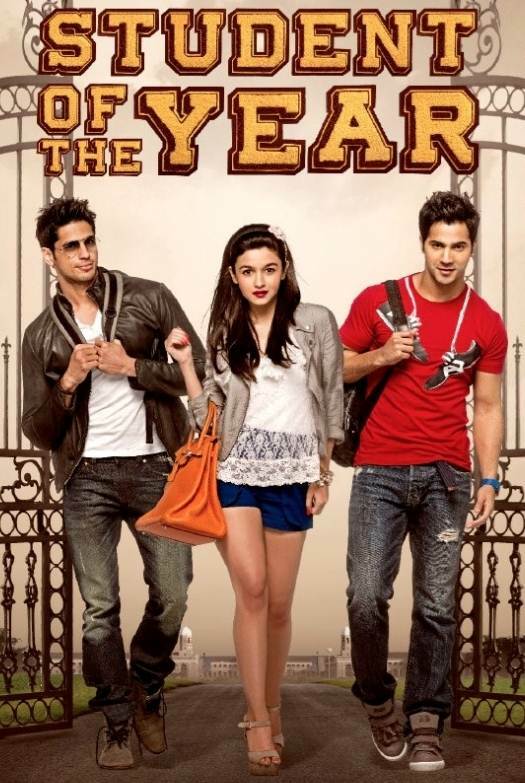 Varun looked promising since first promos itself and he does perform well, if not perfect. 4. The competition sequences. Shout worthy. Picture perfect. 5. Songs. Sounded average in headphone, looked great on screen. 6. For a change - no boring 'first half' of second half (as many recent movie suffered from that thing), it actually gets interesting as the competition starts from that point. 7. Hence, no dragged thing here, movie ends as soon as it should. Overall pace is perfect. 2. Dear KJo. Atleast you could've spared homosexual jokes. I mean, how the hell could you do such silly jokes on Chintooji ?? 3. Poorly written climax. Pointless dialogues by competent Kayoze Irani. 5. Trying to be loveble - JTYJN like get together of friends. Nah, didn't work as it should. Ash King and Pritam. And the result is predictably sweet. Chup Chup Ke goes on Pee Loon way, hits chord instantly. Reprise by Shaan has pretty much similar thing to offer. Fukraa is average with punjabi pop'ish sound. Tulsi Kumar spoils a track again, this time its with Anupam Amod - Mumkin Nahin is a decent one, tried and tested one. O Re Khuda has Adnan Sami as its plus point. But the annoying part is 'o rey khuda' itself. Sparing those typical phrases, Adnan makes it an engaging track. Rab Ka Junoon is that 'Rock' track where the lyrics are hardly audible. Avoid. Last one - Hote Hote has Hard Kaur's rap - that sounds dated by now. Pritam and Emraan Hashmi combination, this time, works only in parts, with all the tried and tested sounds. Though, never expected great things for this one. So, acceptable. Absolutely catchy and addictive Kikli Kaler Di starts off the album as a perfect trailer for the fun ride ahead in Amit Trivedi composed Luv Shuv Te Chicken Khurana. With rap of Yo Yo Honey Singh and the loop by Pinky Maidasani, this track rocks with Shellee's funky lyrics sung by Amit himself. You can't help but say 'Ghantiiiii.....' as soon as track comes to conclusion. Motorwada's prelude shows spark of QGM with its hip-hop'ish flavor. Again, this Tochi and Amit sung track ends up as an earworm. Again, outrageous lyrics. The title track Luv Shuv Tey Chicken Khurana is just so charming, with simple arrangements that you almost smell the punjabi rotis and saag. Beautiful use of flute and paayal's sound. Lovely conversation between Harshdeep and Shahid Mallya. You just can't stop drooling over this one. Harshdeep's next Luni Hansi is instant reminder of Dev D. But as the track goes on with this sweet voice, you just forget everything. And start imagining the smile she's talking about. Even though it uses that ghisa-pita phrase 'Gud Khake'. Oh, and do wait for conclusion of the song. Devender Singh (the Sardarji from Indian Idol)'s version of Luni Hasi is equally good but a bit softer side his singing is. Next track, Makkhan Malai starts almost like Dhinka Chika. Ok, got my point? Yes, found this one an average one. Maybe works well with a shaadi-like scene in the movie. Farukha Baadi kicks off with 'womaniya type' chorus, with FO and all. 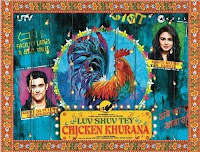 Soon Labh Janjua takes over the track with Amit in his own flavor - that you want to stand up from where you are sitting and shout Khula khel...... Luv Shuv Tey CHicken Khurana Theme is such a lovely instrumental, Iktara played by Tapas Roy. Not identical to any song but pretty much in-sync with the flavor of soundtrack. Finally, the ride concludes where it started. Another version of Kikli Kaler Di, this time an all Punjabi, all AMIT TRIVEDI one. Different set of stanzas, this one again, consists of rib tickling lyrics. Such an addictive thing. Amit Trivedi (perhaps) closes his account for this year with very very high balance. The guy, is unstoppable with his innovations. Just imagine how he recently gave Marathi and Southern spice* and now here he is with Punjabi tadka. And another highlight of this album is lyricist Shellee. Its a fultoo fun ride just because of his words. Highly recommended ! My Picks : Luv Shuv Tey Chicken Khurana, Farukha Baadi, Luni Hasi, Kikli Kaler di. *P.S. : After initial grudge, I am actually liking the tracks of Aiyyaa. Grudge was - it has too much of double meaning things all over in the album. But that fact can't hide the brilliant tunes. Loved Wakda, Mahek Bhi and even What to do. Challa - as each and every review out there depicts - is more a 'Rabbi' song than Rahman's. But the ARR stamp is there ofcourse, during interlude, the 'saregama' piece sung by chorus. Pretty hummable one despite the fact its entirely in punjabi. I know it doesn't work with SRK lip syncing it, but well as a standalone track - it works, just because of Rabbi. Opening with dramatic arrangements, Saans instantly reminds you of ARR's own-Yuvvraaj. Barring very cliched lyrics (perhaps to get - mass appeal - I seriously ) this one works cause of its tried and tasted sound. Shreya is as usual and similarly, Mohit. Oh, and did I forget to mention strange similarity between this and Do pal ruka (VeerZaara) ? Not exceptional, yet likeable one. Mohit's voice gets stuck even after hitting the stop button. Ishq Shava - is foot tapping from the very first 10 seconds. This too has footprints of ARR's earlier works. At places you almost hear Hawwa Hawwa and at other there's Behka. Raghav's voice (including all that hey, paun paun) sounds a bit unsuitable for this, but Shilpa Rao is just too perfect. Stays with you as long as its being played. Heer - as I assumed while looking at the tracklist - this one is the best from the album. Despite being (yet another) complete punjabi track ;). Harshdeep Kaur (who else?) does fantastic job for this haunting track. The composition, majorly with violins - a trademark Rahman sound - is super rich. Lovely. (oh, and Rockstar reference is here too - find out for yourself). And, here's more about Mirza-Sahiban lovestory. And next-Jiya Re, is perhaps the weakest one of the lot. Despite the peppy loop and lively singing of Neeti Mohan, the track gets messy during the interludes (its just me?). 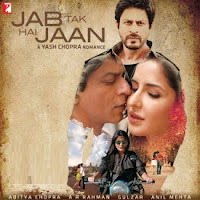 Getting you confused with 'sonu-like' hum, the title track Jab Tak Hai Jaan starts off on impressive note only to fall flat due to sudden tune change. New lady on the block, Shakthisree Gopalan does comendable job, the only saving grace of the song. Saans (Reprise) is just 'that sad part wala slow tempo wala version of romantic song starting with interlude of original'. Ishq Dance is an interesting one with all the percussion and the choir sound. While The Poem recited by SRK leaves us wondering where is this tune in the album - as a song. All said, this one is surely not a fitting finale to the king of romance - Yash Chopra. Given his 'track' record, Jab Tak Hai Jaan leaves a lot to be desired. High expectations come naturally when the 'lethal' trio was involved in making the music. ARR+Gulzar+Yashraj. But surprisingly neither the magical melodies are there, nor the notable poetry. I seriously doubt this one is penned by Gulzar saab. This, is one good, not great album that it needed to be. My Picks : Heer, Saans, Challa. Highlight of Bolo Na is Shankar himself. This Raga based song beautifully transcends in second half with Tablas and ends with a bit high note. This is one of the best classical rendition this year. Bechayan Sapne's lilting tune creates Bengal in front of eyes instantly. Lead by Abhijeet Sawant and Mahalaxmi Iyer, this is a delightful one with interesting use of sax. Next Jeeney ki Wajah is a fantastic chorus effort lead by Raman Mahadevan (along with Aarti Sinha, Mani Mahadevan, Kshitij Wagh, Pooja Gopalan,Shreekumar Vakkiyil) . This anthemic tune, surely gives goosebumps with his vocals. Next Ishan travels the same route, in a more pacey way - director Bedabrata Pain leads the same chorus through a fab conclusion, making the track - which despite being a situational track, works as effectively as standalone. Next four tracks are Instrumental treat. The Battle, Masterda, Inspiration and Chittagong. Each one is so masterfully done, buy too short that leaves listener craving for more. 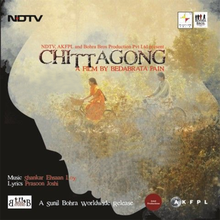 Overall, Chittagong is that perfect album Shankar-Ehsaan-Loy and even the director have thought of. A sheer delightful soundtrack for the period film.